This simple soup is a recipe of the week suggestion (among many others!) for our CSA members. It’s officially that time in the farm season when the summer squash and zucchini plants are going crazy!!! We plant successions of these seasonal crops so we’ll have an abundance of them until the fall. We love zucchini so it’s an easy ingredient to always have on hand. This particular soup is incredibly flavorful and a great first course to accompany any summer meal. The fresh flavors of the season shine and make this a great soup to serve even on the hottest of days. Skip using store bought veggie broth here and stick to water as it will help the natural flavors of the fresh ingredients steal the show. This soup is refreshing, creamy and a great way to celebrate the harvest. Serve with a glass of dry white wine (you’ll be using a little in the recipe so don’t let the rest go to waste!) and some crusty bread for dunking into the soup bowls. In a large dutch oven or heavy-bottom saucepan heat the oil, crushed red pepper flakes and leeks over medium heat and sauté, stirring occasionally, for 8-10 minutes. Add the garlic and continue to cook, stirring often for about 1 minute longer. Add the wine and cook until most of the liquid has evaporated. Stir in the zucchini and salt, cover the pan, and steam over medium-low heat for about 8-10 minutes, or until the zucchini is just tender. Transfer the mixture to a high speed blender with the basil and 2 cups of water. Blend on high until very smooth. Return the soup to the pot and keep on low heat for about 10 minutes so all the flavors blend together. Taste test and adjust seasonings as needed. 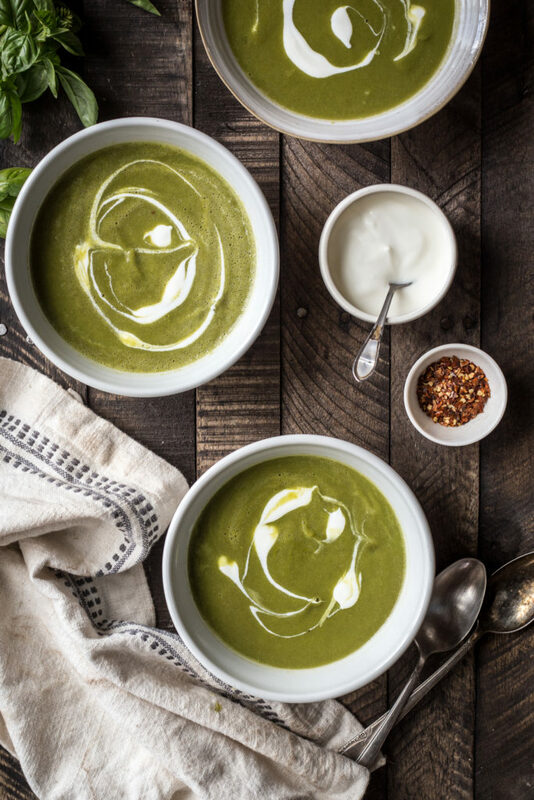 Divide the soup between bowls and stir in a dollop of whole milk yogurt and a tiny drizzle of extra virgin olive oil. Serve with crusty bread and a glass of white wine.